It’s a long way from my house to Hays, Kansas. 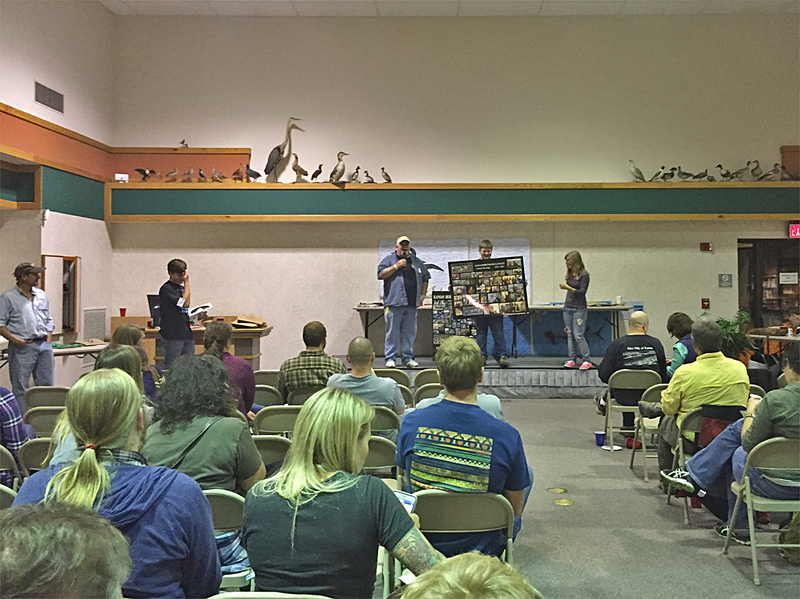 Eleven hours behind the wheel is enough to make one wobbly, wild-eyed and weary, but the annual meeting of the Kansas Herpetological Society was worth it. A big part of the KHS meeting are the presentations that occupy the daytime hours. Listening to herpetologists speak on a variety of topics is an intellectually energizing experience, even when the details may be over my head. I don’t know much about P-values or Bayesian inferences, but I can ponder the big questions as well as anyone. Eli Greenbaum from the U of T – El Paso was the keynote speaker. His topic: “Mambas, Malaria, and Militias: 21st Century Herpetology in the Jungles of the Democratic Republic of Congo”. 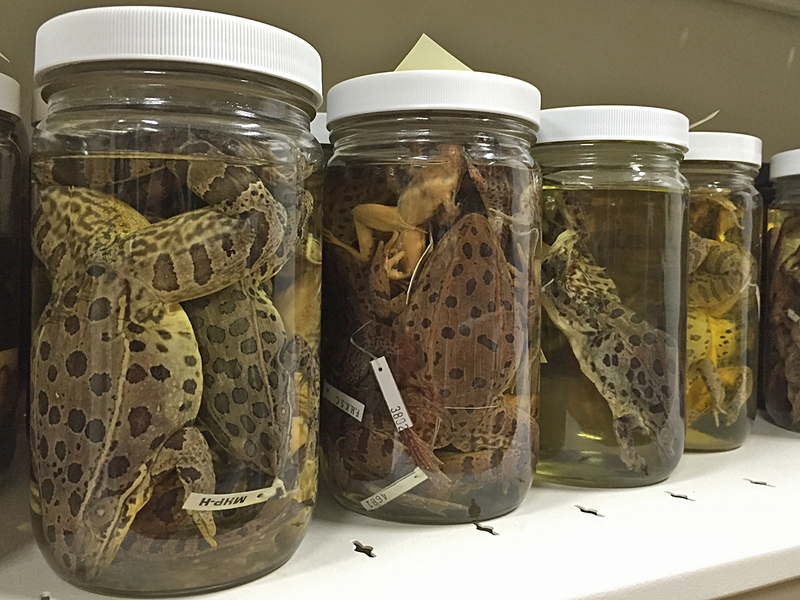 Dr. Greenbaum put the DRC into herpetological perspective – the largest country in Africa, with immense areas of relatively intact forests, savannahs and other life zones. Compared to other countries in Africa, not much work has been done on the herpetofauna, owing to a lack of infrastructure, and extended periods of civil war and the violence that comes with it. Imagine, as the good doctor told us, having to hire the local militia (the bad guys) to protect yourself from the army (alleged good guys). Dr. Greenbaum and his associates seem to have found the right way to get around in a very sketchy place. 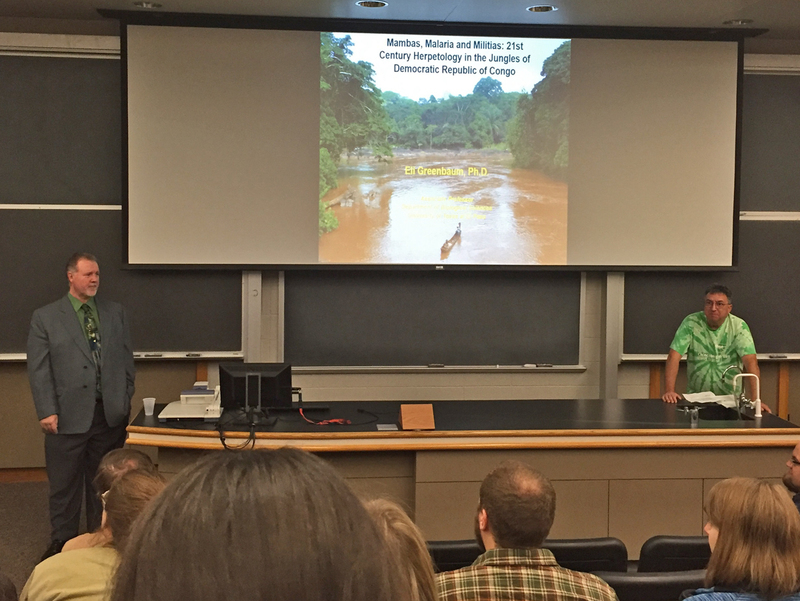 He described his research into deep-forest speciation in the DCR, where deep rivers (like the Congo) can hinder gene flow. He used the toad genus Amietophryne as an example; there are at least 17 species of this toad across the forested portions of the DCR. Some species are similar to others in appearance, others are markedly different, but all of them are genetically distinct. Mike Lannoo and craw-diddly friend. There were other great presentations as well. 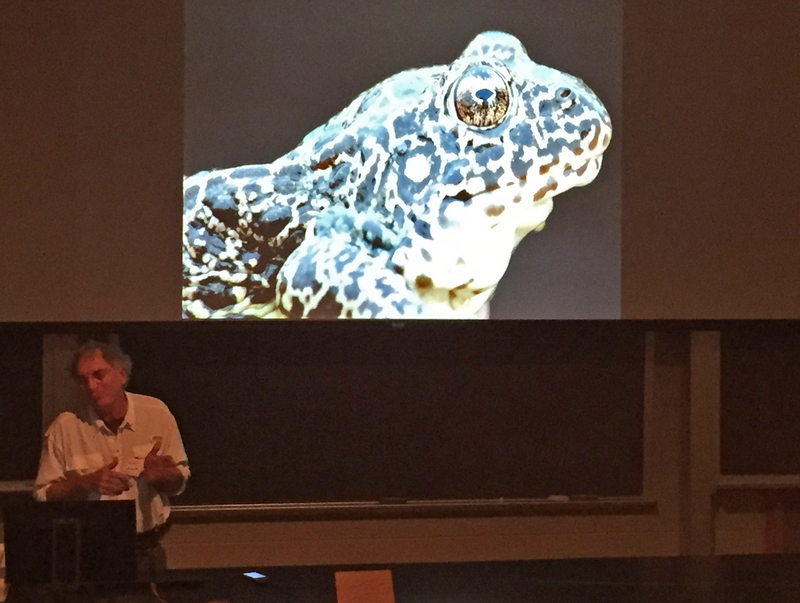 Mike Lannoo gave a summary of the recent Crawfish Frog Symposium, and from that I learned more details of their natural history. Crawfish frogs don’t hibernate; they stay active in their crayfish burrows all year. What happens, I asked, when the water table in the crayfish rises and freezes? The frogs either select a hole high enough to avoid this, or they are forced to move to another burrow and take their chances. The worst thing that can happen to crawfish frogs is a combination of heavy rains, followed by ice and snow, which can entomb them in ice. Mike also gave me a tip for approaching calling males, which I can’t wait to try out when Snoring Thunder 2016 rolls around. The Saturday and Sunday presentations were held on the Fort Hays State University campus, but the awards ceremony, poster sessions, and fundraising auction were held at the Sternberg Museum on Saturday evening. The Sternberg is an amazing place, and we got a behind-the-scenes tour of the collection areas, but that will have to be covered in another blog post. The folks running the event were gracious enough to add my unsolicited HerpMapper poster to the session, for which I again say thanks! 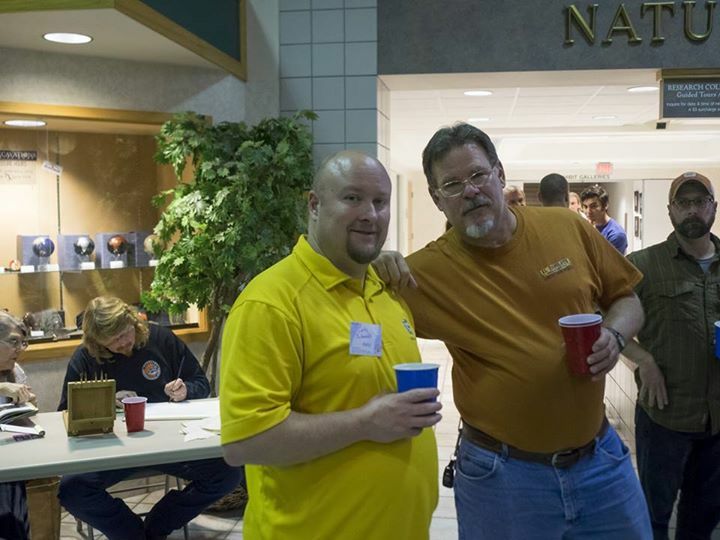 The auction was triple-hosted by Walt Meshaka, Dan Fogell, and Eric Thiss. All three are funny guys, entertaining the crowd as they kept things moving. I was the winning bidder on some books, including Julian Lee’s out-of-print ‘The Amphibians and Reptiles of the Yucatan Peninsula’ (which will come in handy next summer). This was the first auction where I didn’t walk away with an armful of herp-related kitsch (in 2013 I came home with a fire-breathing-dragon music box. Because beer). Great fun at a well-organized event, and the KHS folks are warm and friendly. I enjoyed hanging out with folks I haven’t seen for a while, and making some new friends as well. Then there was the long drive home on Sunday, but long drives are quickly forgotten, while memories of the meeting and the people and the fun remain. Extra thanks to Curtis Schmidt, and to Kevin Urbanek for photo use. Mike, nice little summary of what sounds like an interesting little weekend. I would love to go with you to call for some Crayfish frogs next spring now that you know the secret call.